New tariffs are on hold while China vowed to buy more U.S. goods and may reconsider the Qualcomm-NXP deal. Despite the upbeat tone, President Trump and his hawkish advisers may push too hard. A small 90-day window to hash out an agreement also means things could easily blow up. U.S. President Donald Trump, U.S. Secretary of State Mike Pompeo, U.S. President Donald Trump's national security adviser John Bolton and Chinese President Xi Jinping attend a working dinner after the G20 leaders summit in Buenos Aires, Argentina December 1, 2018. 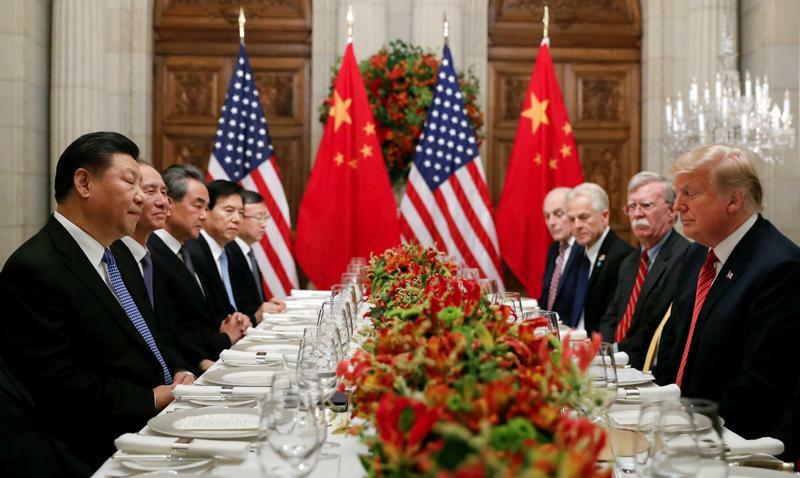 U.S. President Donald Trump and Chinese President Xi Jinping agreed on Dec. 1 that they would not escalate tariffs while they take 90 days to negotiate a trade deal. The leaders met on the sidelines of the G20 summit in Argentina. The U.S. government will not increase import duties from 10 percent to 25 percent on $200 billion in Chinese goods on Jan. 1. In exchange, China will purchase a “very substantial amount” of agricultural, energy and industrial products from the United States. Trump and Xi agreed to begin talks on Chinese structural changes on forced technology transfers, intellectual property protection, non-tariff barriers, cyber thefts and other topics. If no agreement is reached in 90 days, U.S. tariffs on $200 billion in Chinese goods will increase from 10 percent to 25 percent. It was the first meeting between the two leaders since the U.S. government imposed tariffs on $250 billion in Chinese goods, reflecting about half of total imports from the country. China has retaliated with duties on about 85 percent of U.S. imports.